Just a quick line to wish all members and supporters and their families a happy and safe Christmas. 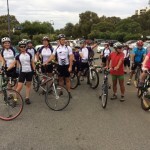 We had our end of year ride on the weekend and finished the year with a fun ride and BBQ. It was great to see new riders, life members, lots of tandems and plenty of laughter to finish our year. Looking forward to seeing everyone again in the New Year. Lots of colour and movement with Christmas Fairy Haylee at the front and Trevor the Elf at the tail.